Verizon&apos;s building at the Hub on Causeway project atop North Station will open in 2021. Verizon Tuesday unveiled plans for a major expansion in Boston, including building out its cellular and Fios high-speed networks across the entire city, and bringing 2,000 employees to a building atop North Station. That office will anchor a new $540 million, 31-story building — the tallest office building built in Boston in nearly 20 years — at the Hub on Causeway project under construction alongside TD Garden. It will open in 2021. Earlier this year, the telecom giant confirmed it would lease 440,000 square feet in the building. Tuesday’s announcement provided the first details of what it will do there. Verizon envisions what John Vazquez, the company’s senior vice president of global real estate, calls a “brain hub,” a place where developers and engineers will work on artificial intelligence, cloud computing, and other advanced technologies the company considers key to its future. Verizon will likely move about 400 jobs there from a research and development facility in Waltham, but Vazquez said he expects most of the roughly 2,000 people employed there will be new hires from Boston-area universities and other tech companies in the region. Verizon is the latest in a string of blue-chip tech companies to launch major expansions in Boston and Cambridge. Amazon has hired hundreds of workers, with plans for at least 2,000 more at a soon-to-break-ground building in the Seaport. Google is in negotiations for a new building in Kendall Square. Wayfair, Facebook, Spotify, and several others lately have added office space and large numbers of new employees here. Verizon also hopes its new building will help grow a new generation of tech firms. The company will devote five of the 16 floors it’s renting to space for coworking, incubators, and startup accelerators for smaller companies that it may partner with or invest in. The top floor of the building will have a roof deck and event space that Verizon plans to share with community groups and programs run by the Verizon Foundation. Then there are the signs. 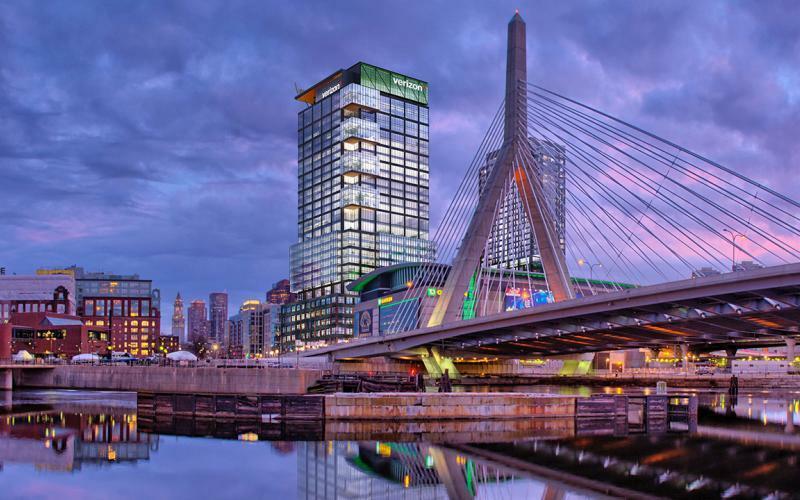 All four sides of the building’s top floor will feature Verizon’s familiar logo, and be visible from the Zakim bridge, Boston Harbor, and downtown Boston. The signs have been approved by the Boston Planning & Development Agency, a spokeswoman for the agency said. Meanwhile, Verizon said it will invest about $300 million in hardware to upgrade its networks in Boston. The company will build out its Fios video and Internet service into the roughly half of the city where it hasn’t yet gone. And it said it will grow its “small cell” network, which complements traditional cell towers, to boost coverage and prepare for next-generation 5G service here. As part of a 10-year deal with Verizon, the city agreed to streamline permitting for small-cell sites, while Verizon will provide services to enhance traffic management, safety, and energy efficiency.